We’d love your help. 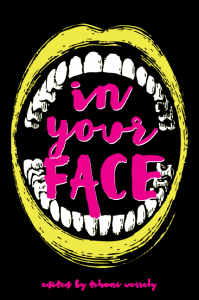 Let us know what’s wrong with this preview of In Your Face by Tehani Croft Wessely. To ask other readers questions about In Your Face, please sign up. The front cover of In Your Face. Yes, it's ugly. The book sets itself to tackle potentially distressing subject matter, things that challenge what we think is ‘right‘ by showing the justification for the dark side, for example. Or Review from https://darrengoossens.wordpress.com/2016/09/18/in-your-face-a-not-quite-impartial-review/. The book sets itself to tackle potentially distressing subject matter, things that challenge what we think is ‘right‘ by showing the justification for the dark side, for example. Or just hideous mental images. It contains the long and somewhat contentious ‘Wives‘ by Paul Haines, and it and some of the other pieces (‘No Fat Chicks‘ by Cat Sparks, the story that triggered off the whole book, for example) ask us questions about the fundamental nature of human beings. We are animals. For tens of thousands of years, might did make right. The ancient Greeks for all their civilisation kept boys for their pleasure -- not something acceptable where I live. Mores change. What is universally 'good' or 'bad'? The man who rapes a lot of women will ensure that his genes stay in circulation, and is thus anything but a perversity when viewed against the imperatives of survival and evolution. Is tolerance really a virtue, or just the top of the slippery slope, asks Ian McHugh, in 'Tolerance', a story that opens 'The paedophiles are protesting again'. 'Home and Hearth' by Angela Slatter is one of the most powerful pieces. It asks unflinchingly about the limits of parental love. A clutch of stories look at the unseen implications of leaving our children a world in dire straits, when we are fighting the planet itself and there are no spaces left for niceties. And some, like Alan Baxter's 'Bodies of Evidence', conjure up some gruesome scenes, enough to make me (not the toughest of mind's eyes, I must admit) squirm. I'm extremely pleased to be in this book. Not just because for me any story that sells is a minor miracle, but because the quality of the company is so high, the production values are so high, and the book aims to do something more than the already-tough-enough task of assembling some worthwhile reading material. Nearly every story worked for me (the strike-rate is very high), and every single one made me think about my assumptions, about maybe how I was, despite my best efforts, still a creature of the darkness as well as the light. We all think about doing wrong. We all act out of base motives sometimes. It's hard to look that in the face. Available as ebook and large format paperback in most of the usual places, but here is the publisher page. A disturbing anthology, as it says on the box - and it delivers. Some of the stories weren't up my alley, but all were interesting choices. It took me a while to finish this one, because there was so much to think about. Standouts for me were: Tansy Rayner Roberts' Letters to Cleopatra, and Thoraiya Dyer's Where the Pelican Builds her Nest. Ahh, I waffled hard between 3 and 4 stars on this one, because my main problem with it was that I didn't enjoy the reading experience for a good half of the anthology. Which I partly expected, given the theme of it -- these stories aren't meant to be light or approachable or fun -- but partly didn't. Indeed, some of the stories that made me the most uncomfortable, I appreciated as being excellent stories nonetheless. Standouts for me were Jason Nahrung's "A House In The Blue" (partly because it Ahh, I waffled hard between 3 and 4 stars on this one, because my main problem with it was that I didn't enjoy the reading experience for a good half of the anthology. Which I partly expected, given the theme of it -- these stories aren't meant to be light or approachable or fun -- but partly didn't. Indeed, some of the stories that made me the most uncomfortable, I appreciated as being excellent stories nonetheless. Standouts for me were Jason Nahrung's "A House In The Blue" (partly because it sliced VERY close to home for someone who works in health care), Stephanie Lai's "Cherries In Winter, Rivers In Spring" (Steph is very good at cool, subtle condemnation), and Alan Baxter's "Bodies of Evidence" (a nice refreshing crime story in the midst of a lot of stories with a bit more concept than plot). But some of these stories were just not For Me, either in subject matter or prose style or the way the message was handled. And that's 100% par for the course when it comes to anthologies! A lot of how people react to any set of stories is going to depend on what they bring to the table. I, for instance, am just too damn tired of stories about the dehumanisation and commodification and degradation of women, and about sexual violence, because I don't go looking for the ugly parts of my own lived experience in fiction -- I try to avoid it, in fact -- and don't find anything even remotely cathartic in reading about it extrapolated to 'shocking' extremes. It's not shocking. It's just...tiring. One in the anthology would have been fine (and I would have picked Kirstyn McDermott's "Accidents Happen", with its tight and Bradburyesque kind of horror); three plus a novella just left me feeling grimy and pissed off. Another stellar anthology from Fablecroft Publishing. But tread with caution: trigger warnings abound. In the interests of full disclosure, I had the pleasure of proofreading this book. But I'm certain I'd gush about it even without that association. The book is packed with short stories from some of the best contemporary speculative fiction authors. And all stories touch on taboo or uncomfortable subjects (which I absolutely relish). Kaaron Warren's 'All Roll Over Another stellar anthology from Fablecroft Publishing. But tread with caution: trigger warnings abound. Kaaron Warren's 'All Roll Over' is a must read -- seriously, buy the book for this story alone. Written from the point of view of a mattress, it bears witness to all manner of psychological and gothic horrors. Craig Cormick delivers a disturbing take on the Pan mythos, in 'The Lost Boys' -- where the Boy Who Wouldn't Grow Up's motives for befriending the Darling children are far from wholesome. I will never be able to read Peter Pan in the same light again. Alan Baxter delivers another of his trademark character driven stories. 'Bodies of Evidence' is set in a world where organ harvesting is a commonplace crime, and body enhancements and self-mutilation are the height of fashion. And lastly, Paul Haines's 'Wives' is an awful vision of a future Australia where criminal cartels rule and where men vastly outnumber women. The lengths men, and the supplying gangs, will go to in order to procure a wife is truly haunting. From grim misogynistic dystopias to domestic violence very much in the here and now, this book delivers exactly what it says on the tin. While some stories unsettled more purposefully than others, those that hit their mark did so very well (Cat Sparks, Kaaron Warren and Stephanie Lai all contributed stories that have stuck with me, belated as this review is).